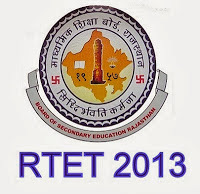 Rajasthan Teachers Eligibility Test (TET) Exam 2013 Postponed Indefinitely by Rajasthan Board of Secondary Education (RBSE), Ajmer which was earlier scheduled on 29th December 2013. Now candidates are looking for RTET 2013 Admit Card Download, Print from various website but candidates are advised to wait till further notification as RTET is Postponed. RTET Exam 2013 will consists of Objective questions Multiple choice questions . RTET Exam will be held in two level (Level I &amp; Level II). The exam was scheduled for December 29. The move came after a series of representations highlighted that RTET exam was coinciding with national level exams like NET and SSB exam.This exam has faced the ire of designated chief minister Vasundhara Raje. During several election rallies, she has criticized the exam pattern and advocated changes. RBSE also clarified saying that a new date has not been announced as they are unable to find an empty Sunday to conduct this exam. It is likely that the exam may be conducted after board exams or after May.